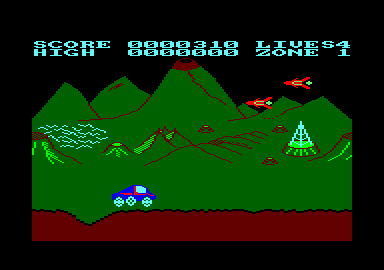 Moon Buggy is a version of the well known arcade game 'Moon Patrol'. In control of a Moon Buggy you can move forwards or backwards and you have the ability to jump over hazardous terrain. As well as dangerous terrain to negotiate, there are also different types of aliens to destroy. As you progress through different zones of the moon the game gets harder, with tougher terrain and hordes of aliens. 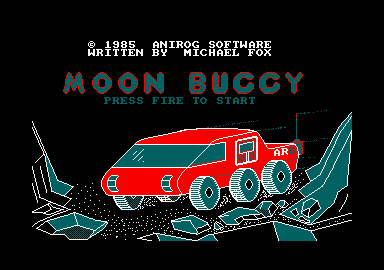 Moon Buggy has managed to capture all the playability of tho original but sadly the graphics and sound stop it from being an excellent conversion. The game is highly playable and very addictive; tho progressive difficulty means that it is a challenge and remains so for quite a while. A good conversion with some nice features but a lot could be bettored.